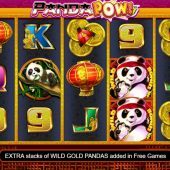 Panda Pow slot, not to be confused with Konami's Panda Power, joins the plethora of other Oriental themed games from across the whole spectrum of slots developers. With this in mind can we ever see one that stands out, maybe like WMS's Wishing You Fortune or Microgaming's Untamed Giant Panda? Usually the Panda implies gentleness and cuddliness, but here we have one that wears a martial arts headband and is liable to display some rather aggressive and unfriendly moves in your direction! We have a soundtrack of tweedling Chinese cymbals and pipes music and a the Lightning Box signature 'snick' as the reels stop. We have a typical 5 reels and 3 rows with 25 pay lines. The symbols are all either single, or double stacked with the exception of our combative Panda which we will come to later. They include all the standard ones you may expect, the Goldfish, 3 Gold Tokens, Lantern, Fan and a bamboo-chewing Panda. The best paying one is naturally our tame Panda giving 20x stake for 5-of-a-kind then 8x for the Goldfish down to 2x bet for the lowest of the card symbols. There are no scatters because the aggressive Panda will pow! in the form of stacked Wilds on the middle 3 reels and he will also be your bonus trigger too, as we will see. If you land a stacked Panda Pow Wild on reel 2 alone for example he will perform his Bruce Lee act while emerging from the Wild and award any wins. Before the win is paid, you will get a slow 'heartstopper' spin because 2 or more further Panda Pow Wilds will trigger a free spins bonus as well as improve your win. You can obviously land a maximum of 9 if you fill the middle 3 reels in full, but 5 will award the minimum of 5 free games, 6 awards 8 free games right up to 20 for a full 9. The enhancement in this bonus is that stacks of Gold Pandas will be added to reels 2, 3, 4 and 5 to accompany the existing stacked Panda Pow Wilds on reels 2, 3 and 4. You can retrigger the free games in the same quantities described earlier but only the Pow Pandas act a triggers and not the Gold Pandas.